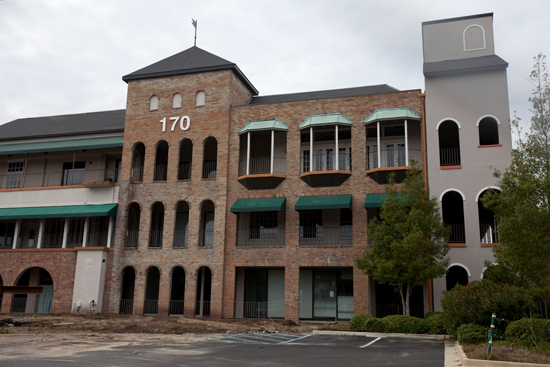 A portion of the original Uptown Square shopping center on Broadway Street has been cleared for demolition to make way for an expansion of the Lambeth House senior living facility. Meanwhile, a historic Central City gas station will be preserved and the fate of a church next to Ochsner Baptist Medical Center will be postponed by a month, based on decisions Monday by the city’s demolition-review panel. The three-story building at 170 Broadway will be replaced with a three-story, 42-foot building no taller than the current building, said Scott Crabtree, CEO of Lambeth House, in an appearance Monday before the Neighborhood Conservation District Committee. 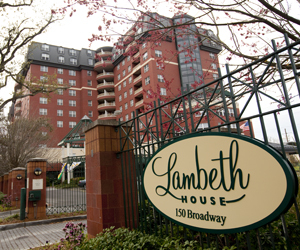 “We’re requesting demolition to construct a new state-of-the-art holistic wellness center and nursing care center as an expansion of Lambeth house on that site,” Crabtree said in brief comments before the committee. The wellness center will be on the first floor, with the nursing care center on the second and third floors above it, Crabtree said. With brief questions from the committee about the height of the new building, the demolition was approved by a 9-0 vote. The Uptown Square shopping center was built in the late 1970s, and Lambeth House opened in 1998, Crabtree said. The building at 170 Broadway is the last remaining structure from the original shopping center owned by Lambeth House, he said. 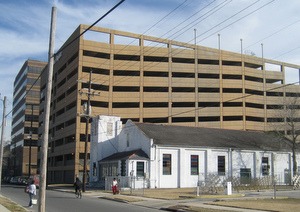 Whether the Greater Rose Baptist Church on Willow Street in the Freret area will be torn down by Ochsner Baptist remains to be seen, after the committee granted a community member’s request for a month delay on the decision to organize a meeting between the hospital and the neighborhood. Ava Collins of Ochsner Baptist told the committee that the church, which the hospital bought in 2006, sits directly behind the Jena parking garage and has been the subject of safety concerns from hospital staff and visitors. After it is torn down, the hospital plans to fence and landscape the lot, Collins said. “We think it’s important from a health care perspective that those being served feel safe,” Collins said. Freret-area resident Richard Dimitry asked the committee to delay a decision, however, so that the neighborhood could meet with Ochsner, preferably at the upcoming Neighbors United meeting on Feb. 14. It’s a “nice-looking little old church,” Dimitry said, and while it’s said to have been built in the early 1950s, he said he remembers it standing there before then. At the suggestion of committee member Georgia Bryant, the church issue was postponed until March 5. The historic Ratliff’s service station on Washington Avenue near South Galvez will be preserved, as the owner continues to repair it. Michelle Kimball of the Preservation Resource Center noted that the building has been deemed eligible for the National Register of Historic Places, so any demolition would have to go through that process. Actually, the last remnant of the Uptown Square shopping center is still there and is not presently scheduled for demolition. It currently houses Tulane’s Multispeciality Clinic, ROTC offices, Human Resources, and a number of other university offices in addition to a real estate brokerage office. I was thinking the same thing as Randy, but wondering, hmmmm are they moving the Tulane offices out? Thank you for pointing that out, Randy. I reviewed Crabtree’s comments on the video, and he says that 170 Broadway is the “only remaining part of the shopping center that is still on the Lambeth House property,” and I didn’t realize that portions of the property (such as 200 Broadway) are owned by other entities. Sorry for my confusion — I’ve updated the article to correct the errors. Do we know who is funding this demolition?